Here is some feedback from Holly from her first week with the exercises we prescribed for her. It was interesting to hear that Holly felt “claustrophobic”. I have had many clients say this in the past and they all had similar muscular systems. 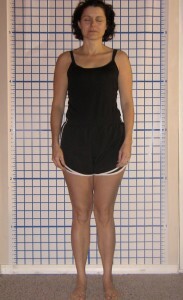 Holly has very little muscular engagement around her hips which is the cause of her poor posture. As she was doing the exercises and the muscles around the pelvis begin to engage it makes them feels tension they do not normally have. That is what causes that claustrophobic and a feeling of needing to stretch all the time. 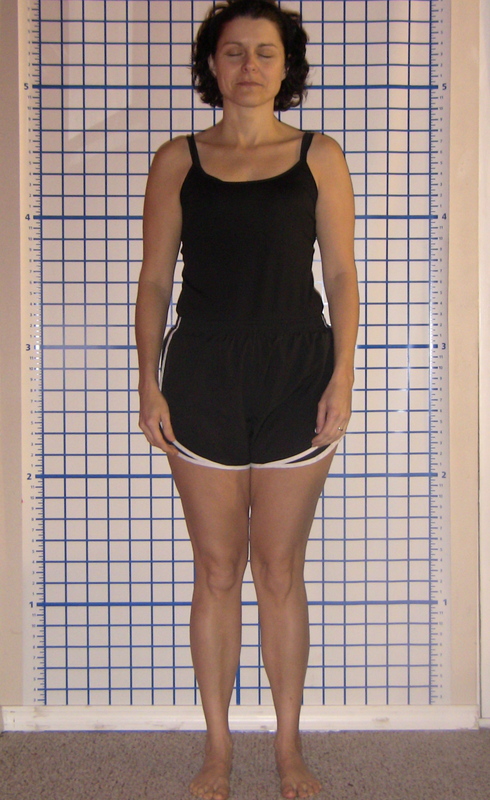 Here are her pictures from the second round of postural photographs we took. These were done 6 days after the first set. For Comparison purposes I am going to put the first picture we took on the left with the more recent one on the right so you can see them side by side. As we mentioned in the first post one of the most glaring imbalances Holly has is in her pelvis. 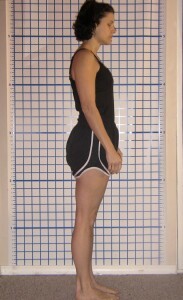 In the picture on the left notice how far out in front of her the pelvis is. 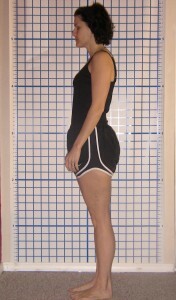 In the more recent photo on the right you can see the transition as her pelvis begins to come back underneath her. 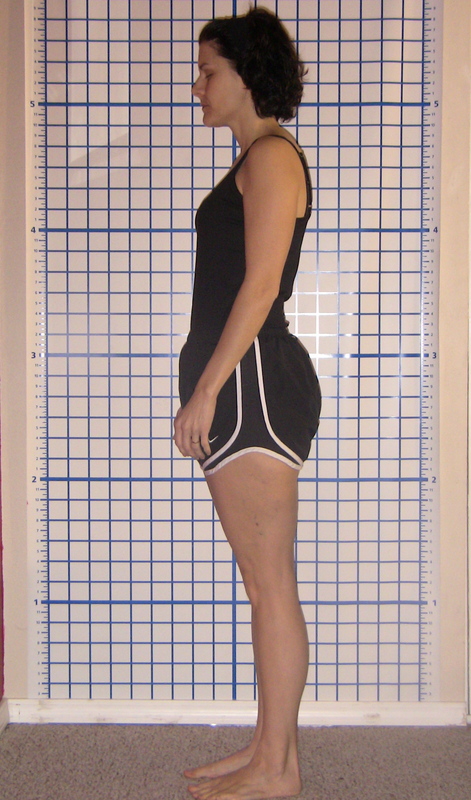 This is from the tremendous amount of muscle stimulus she did this week to restore the efficiency around her pelvis. Also notice that her pelvis is not rolled forward as much as it was previously. You can see the same thing her on the left side of the pelvis as well. Also notice how much less pressure she has in her lower back. 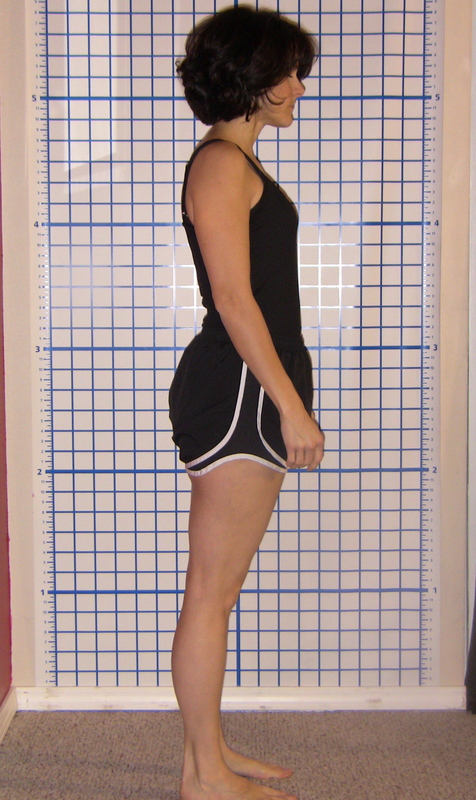 We will continue to promote greater positioning of the pelvis in her next round of exercises as well. From the front view our hunch was correct. I figured that the tremendous amount of tightness Holly had in her upper back was masking some form of imbalance. In the new round of photos we can see that the left shoulder is quite a bit higher than the right. Now that her muscular system is relaxing this imbalance is more pronounced. We will be addressing this in her new routine. We will update you again next week.